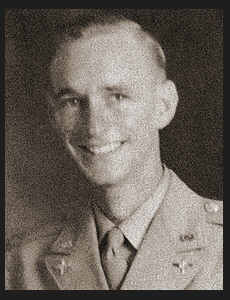 F/O Edward L. McFall, son of the Luther R. McFall, graduated from Tipton High School and Tillman Co. Jr. College; husband of the former Nadean L. Dooley. Entered Air Corps in Feb, 1944, trained in Victorville, Cal. and Denver, Colo.